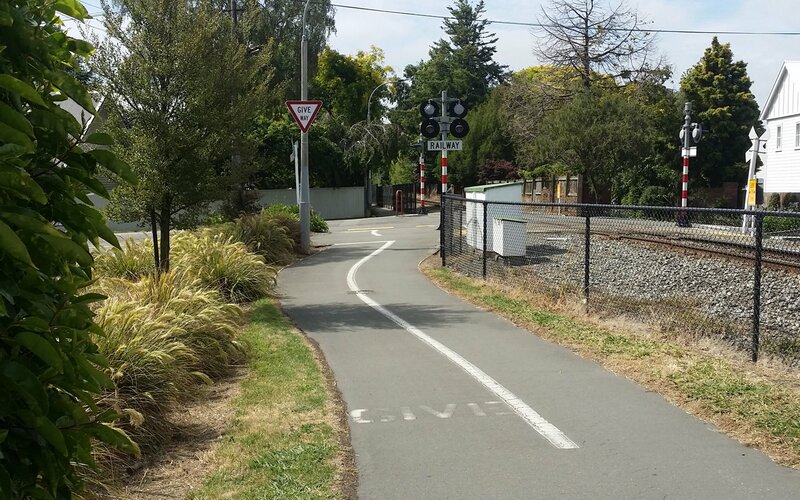 The Christchurch Railway Cycleway was developed in stages, with the northern sections the first to appear. Slowly the route headed south towards Bryndwr and Fendalton during the late 1990s. 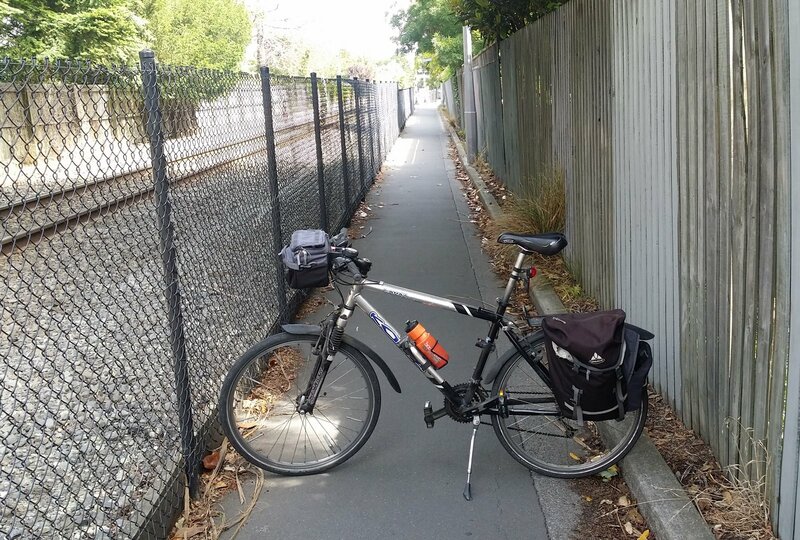 Interestingly, there was some concern by the locals in the more leafier suburbs about the prospect of a cycleway on their back door bringing more crime and vandalism to their neighbourhoods. Fortunately, the evidence from the previously built sections showed quite clearly the folly of this perspective (plus evidence elsewhere), and the growing demand to “complete the route” saw the cycleway reach Matai St by 2001. Further extensions south to Kilmarnock St and north to Tuckers Rd appeared in the following decade. 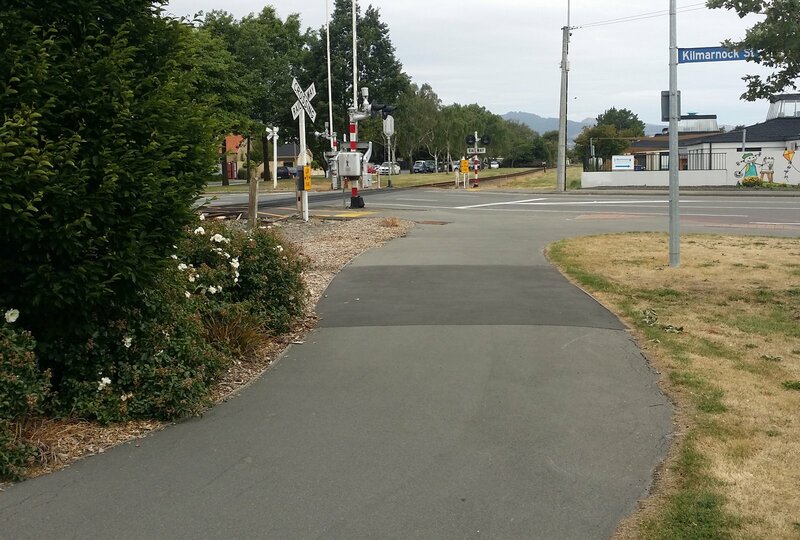 While it is invariably referred to as the “Railway Cycleway”, the route is in fact a shared pathway with pedestrians. An important role it plays is to provide connections to nearby schools, including Chch Boys and Girls High, St Patricks Primary, Waimairi Primary, Papanui High and Casebrook Intermediate. 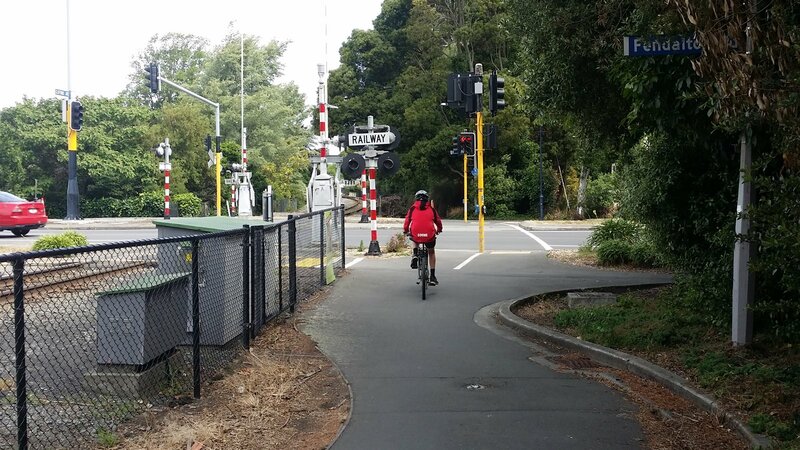 The busier road crossings along the Railway Cycleway have signalised crossings. They also have approach detectors in advance of the crossing so that, by the time you have arrived at the crossing, the traffic signals are likely to have changed for you. 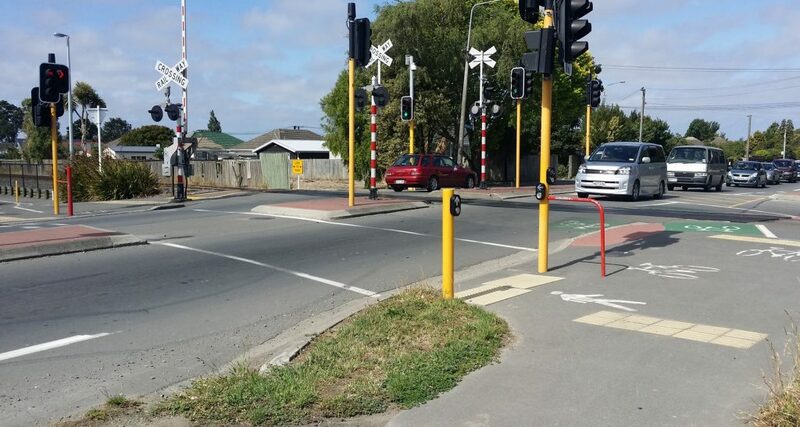 The quieter road crossings involve just simple Give-Way controlled crossings. Some of these are starting to get a bit busy during some parts of the day, so signalising would be helpful. 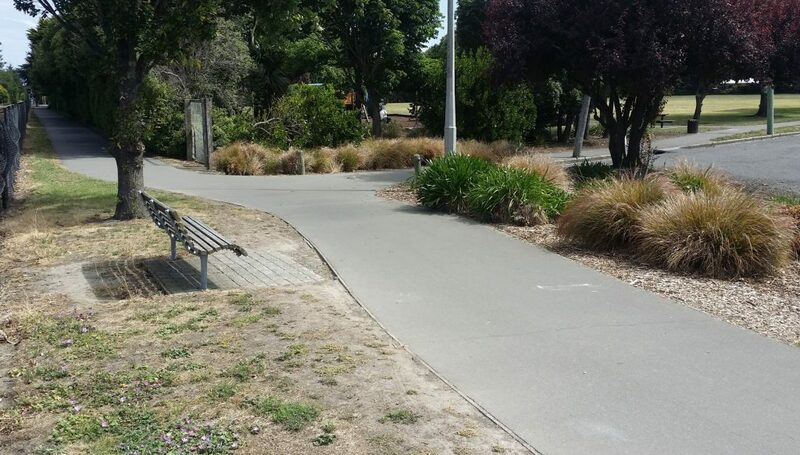 Along the route, there are also connections to adjacent side streets and pathways, which allow additional ways to get on and off the cycleway. 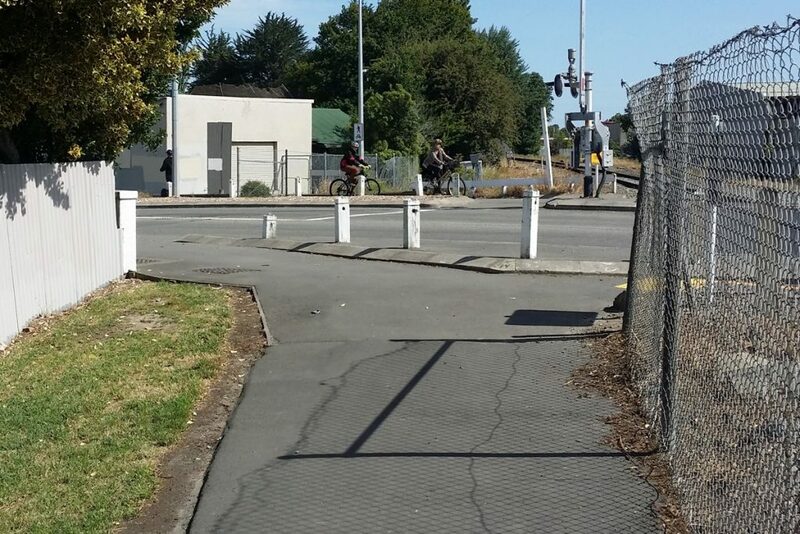 At Bellevue Ave in Papanui there’s even a tunnel under the railway line to connect the streets on either side. 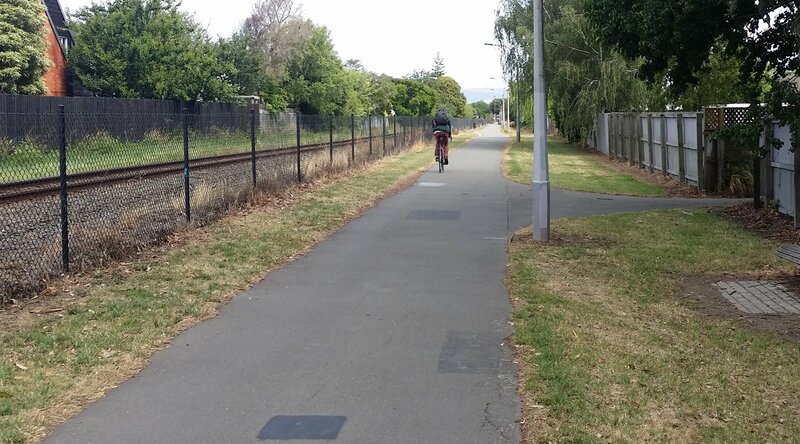 Most of the newer sections of the cycleway are of a wider width (e.g. 3m), often with generous run-off shoulders as well. But there are a couple of sections in the middle where the available path width is struggling to even be 2m wide. 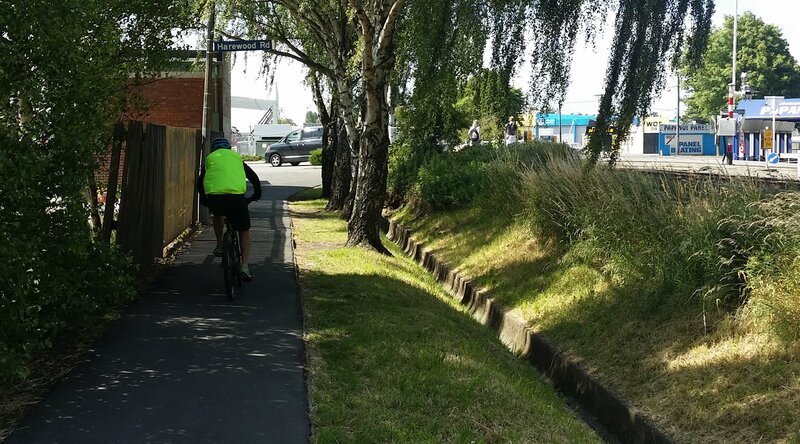 This can prove to be an issue when there is a bit of path congestion (even more likely in the future as the Major Cycleway programme rolls out). 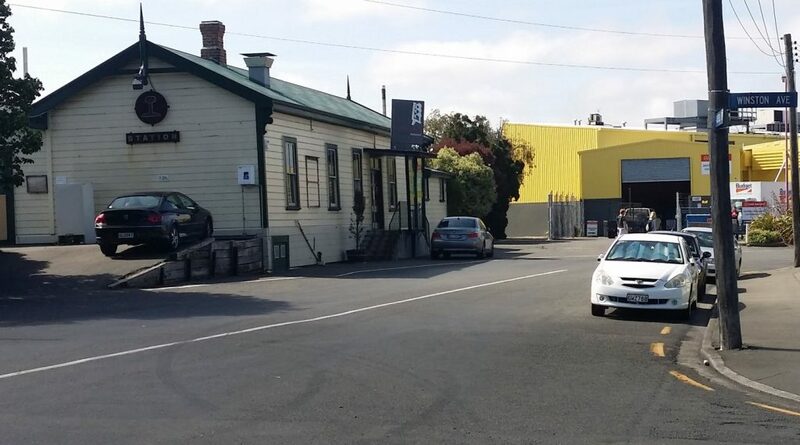 There’s also a bit of a gap in the middle as you get to Harewood Rd in Papanui. 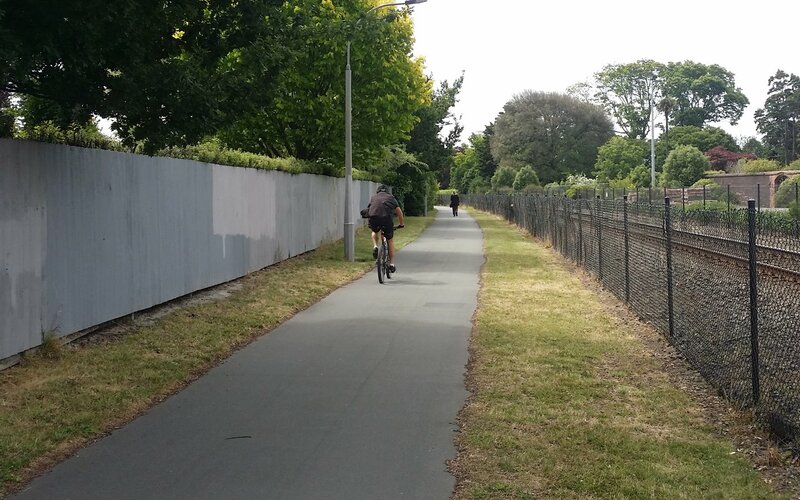 At the moment it’s not immediately obvious that you need to swap over to the other side of the railway line here and heading north you will find the cycleway restarting from just past the old Papanui railway station on Restell St.
At the moment, you can only go as far north as Tuckers Rd in Northcote. A track has been worn beside the railway line north of that through to Sturrocks Rd (where a nice path continues in Barnes Reserve), but technically it is illegal to go alongside the railway here at present. There is an alternative link north through Farnsworth Pl and Redwood Park at the moment. To the south, the route currently stops at Kilmarnock St in Riccarton. It is possible to travel further south along Mona Vale Ave and down a path into Brockworth Pl, but it can be quite difficult to cross Kilmarnock St and Riccarton Rd when they’re busy. A bit narrow leaving St James Park – and where next? More of this to the north? This will make a highly popular cycle route even more valuable to the city’s cycle network. 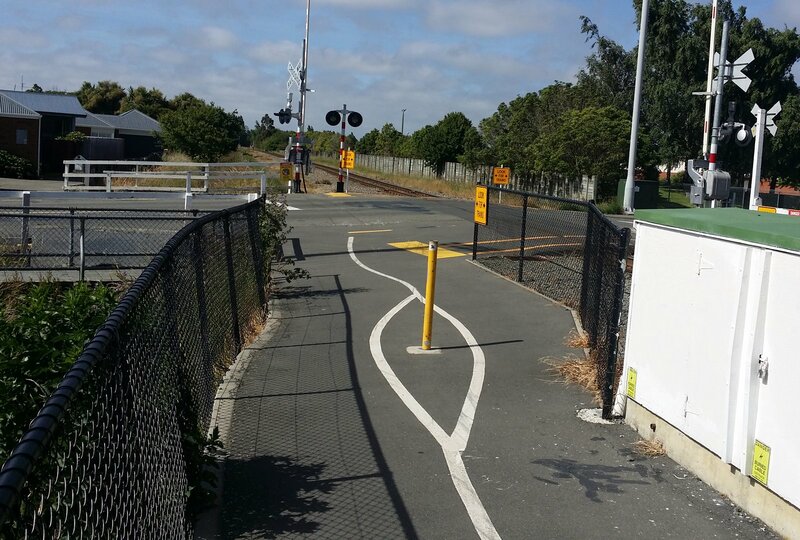 Have you used the Railway Cycleway? What do you think of it? yup. I have. It’s awesome. 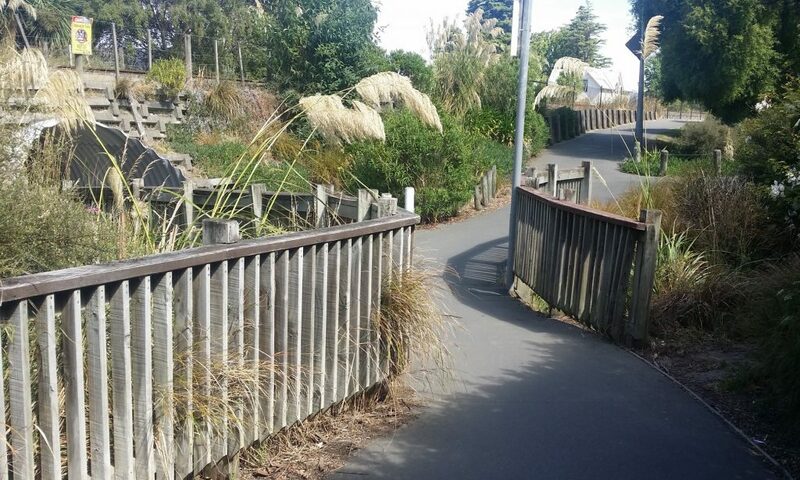 Always enjoyed biking along there when I was at university in Christchurch ten years ago. Hope to ride it again one day. It’s great, especially when the lights change for you, but that narrow section will need to be addressed as it’s already dangerous with a risk of catching handlebars in the wire fence. Heavier usage will make it much worse. Even creating a little extra handlebar space would help with some kind of change to the fence. I LOVE the cycle lane! I live in Amberley and drive in as far as Sturrocks Road then park up and hop on the bike! 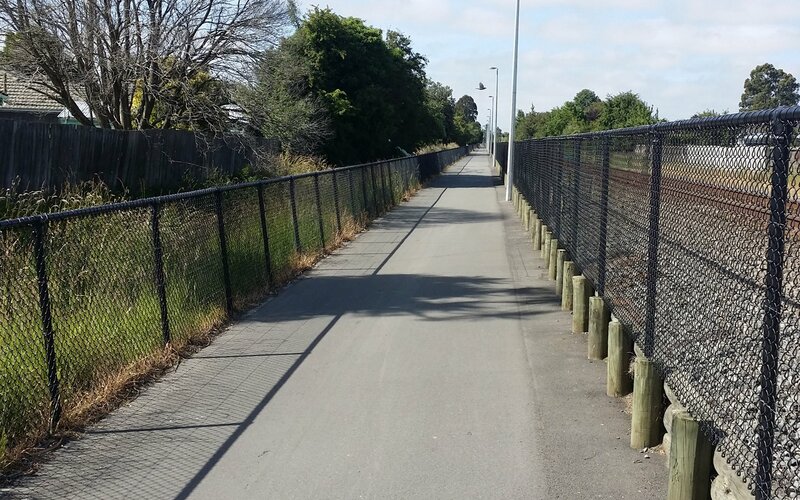 I cycle the whole track to Fendalton Rd and then through Hagley to Salisbury and on to Manchester- I do it 3 times a week so have given the gym membership the hike too. I love caning my fitness between the crossings which can be a bit hit and miss but then it adds to the variety and it is never unsafe so that doesn’t really bother me. It’s not overly crowded either so I have taken to it really well and don’t feel pressure to keep up- I go my pace and so does everyone else- seeing all the gardens burst into Spring and watching communities lives around me adds WAY more to my commute than sitting in my car and waiting on Marshlands Rd.. it’s about physical and mental health. I try to do 4 times a week and through 3 seasons of the year it is DEFINETLY the way to go for me! Work has showers so I can start my day pumped and fresh so it’s win/win all round!
" there is an alternative route north through Farnswood Place and Redwood Park at the moment "
"No Through Route" and the cycle sign along the alley into Redwood Park is completely obliterated by foliage. 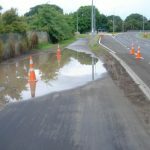 The Shirley Papanui Community Board resolved to rectify this…………… two years ago.